The Russia-backed separatists launch 51 attacks. 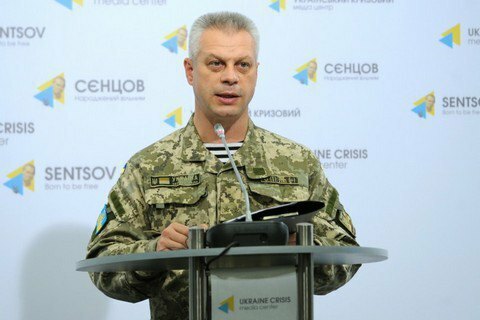 No Ukrainian soldiers have been killed but four have been wounded in the Donbas conflict zone over the last 24 hours, a spokesperson of the presidential administration for the aniterrorist operation (ATO), Col Andriy Lysenko, told a briefing on 29 June. "Over the last day, we haven't lost any Ukrainian soldiers, but four have been injured in engagements," he said. The Russia-backed separatists 51 times attacked Ukrainian army positions in eastern Ukraine in the past 24 hours, including 24 times in the Donetsk sector, 24 times in the Mariupol sector, and thrice in the Luhansk sector. When asked to comment on reports about the death of two soldiers on Wednesday morning, Col Lysenko said the summary included data relevant as of Wednesday midnight. Vasyl Slipak, who for 19 years has lived in France, sung in Paris's Opera Bastille and joined the Right Sector at the beginning of the ATO, was reported killed on 29 June.